A lot of people talk about fear. Have you ever heard about the following fears? You may ask yourself, what exactly is fear? If you look at the word fear, it’s meaning is similar to that of being scared or frightened. When you are fearful you may be hesitant to do something, or think again before you take action. Throughout the ages, it has helped humans to stay safe. Think about it, if you stand on top of a building, you won’t just jump, because you know that you will probably die! And thousands of years ago humans would stay away from lions and tigers, because they felt fearful of being eaten alive! Most of the time fear helps us to make calculated risks about what to do and what not to do. So fear could be a healthy emotion that helps us to stay safe and protected. However, today’s world is pretty safe (in most places!). Feeling fearful is not very helpful. How often have you felt fearful of doing something, like starting your own business, asking someone out or simply talking to a stranger? In today’s world it is less an emotion related to life and death situations, but more an emotion about risks and rewards. When you let fear stop you, it means that you see more risks than rewards. The Opposite of fear is courage: That its going to be okay and you still go for it. Even if you fail, it would have helped you to learn something or get feedback in some form and you can change your approach until you succeed. How do we turn our fear into peace of mind? Here are 4 steps you can take today to do so. Step 1. What are you fearful about? Step 1 is to clearly identify the situation that you’re fearful about and what consequences you are afraid of. Are you fearful of starting your own business and possibly lose money? Do you feel fear to ask someone out and be rejected? Clearly identify the situation and the consequences that you fear. Step 2. What are all the benefits of taking the action? 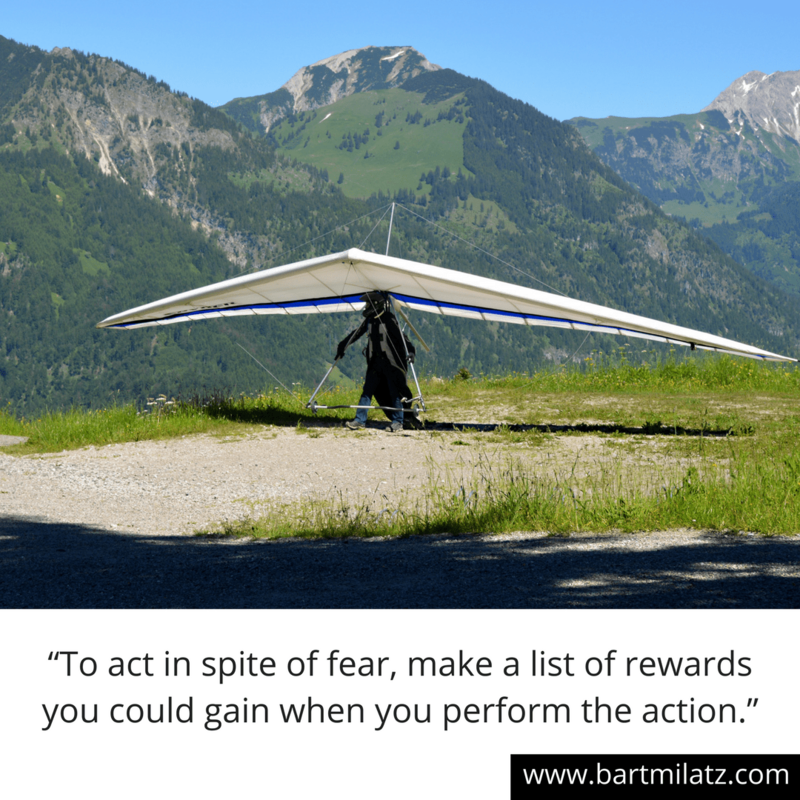 Step 2 is to identify all the benefits of taking the action and not letting fear stop you. For example, I used to be fearful of becoming a public speaker and putting myself out there. I was afraid that people will laugh at me and shame me. So I wrote a long list of benefits of putting myself out there and speaking. 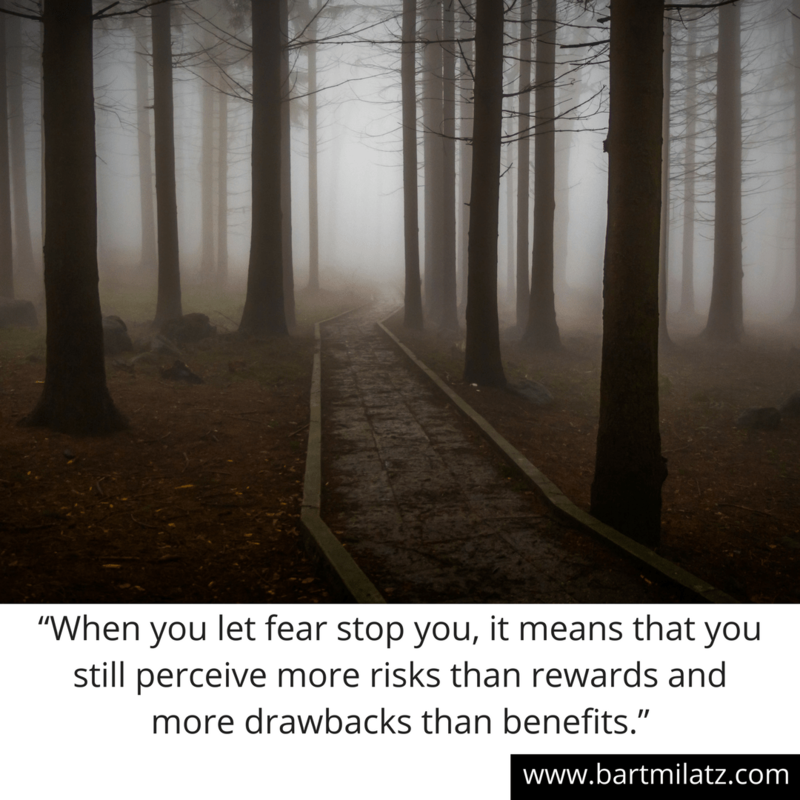 When I made this list and consciously saw that there are many more rewards than risks, I started to take action and didn’t let my fear stop me. Step 3. What will you lose if you don’t take action? Step 3 is to think about what you will lose out on if you don’t take action. Imagine you are 90 years old sitting in your rocking chair. Imagine you let your fear stop you when you were younger. As a result you didn’t get that experience, versus having that experience if you had the courage to go for it. Which one do you prefer? And step 4 is to make a plan. Any part of the situation that you don’t plan could become obstacles in the future when you start working on it. Most businesses have contingency plans that they would use if their first plan didn’t work. Planning provides peace of mind and could help you to overcome your fear. For short term projects, like going skydiving, asking someone out or riding in a roller coaster you don’t really have to make a plan, you just do it. But for longer plans it is useful to plan as much as possible. If you want to take it a step further, look for the things in your life that frighten and scare you. Did you know that excitement is very closely related to fear? With both emotions you get kind of tense and your breathing gets shallow, but the difference is that with fear you don’t take action, and with excitement you just do it. When you are in a fearful state, it is likely that you don’t take action. When you are excited, you take action and go for it! For example, some people are really scared about roller coasters and they never go on one. Other people are scared too, but they are more excited than scared and ride the roller coaster and enjoy it. Every year, choose your biggest fear and just do it. This is the way that I do it. I feel the fear and do it anyway. You don’t need to feel good first to do something. But you will feel GREAT after you have done it! One year it was fear of heights and skydiving. So I went to Dubai to the top of the tallest building on earth and I went skydiving in Sydney as well! Another year I was afraid of teaching and public speaking. So I became a teacher and public speaker. And recently my biggest fear was that of starting a business and putting my ideas out there. As a result I created a website and a YouTube channel. The result is this article you’re reading right now. If I would have stayed fearful you would have never seen me. And the funny thing is that my fears turned into things I absolutely love! After my skydive I went a second time straight away and I wasn’t scared anymore! I now also love teaching and public speaking and I love putting myself out there with my content and videos. So perhaps if you choose to follow your fear, it could lead to something you love as well. Of course I’m not talking about things that legitimately could cause you harm or even death, like taking drugs, hurting yourself or others or anything illegal. In those cases listening to your fear is perfectly rational! Now I would love to hear from you! Have you ever been fearful to do something? 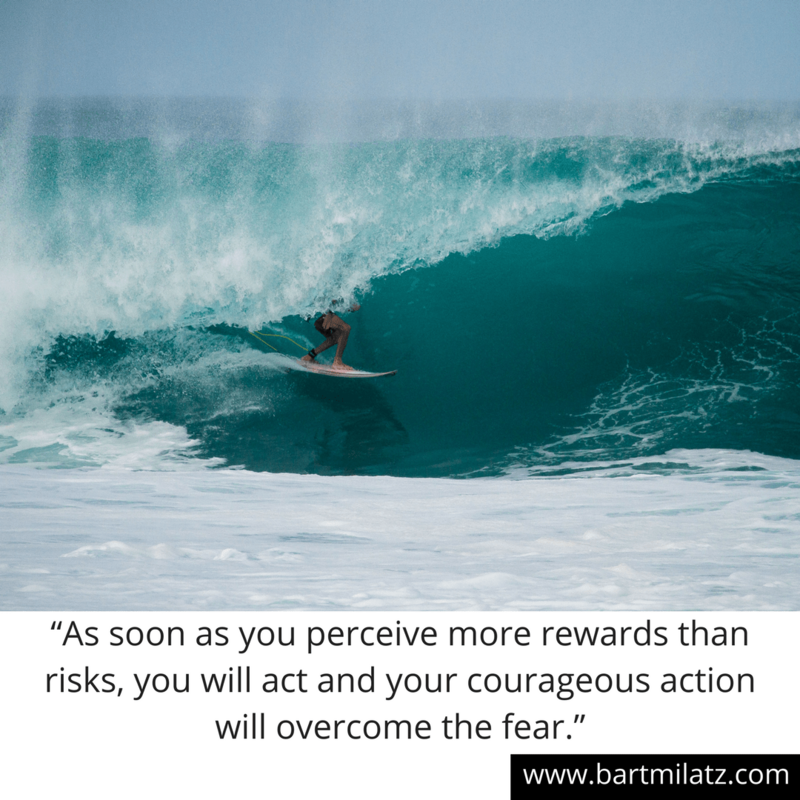 What did you do to overcome your fear and do it anyway? Leave your comments in the section below.